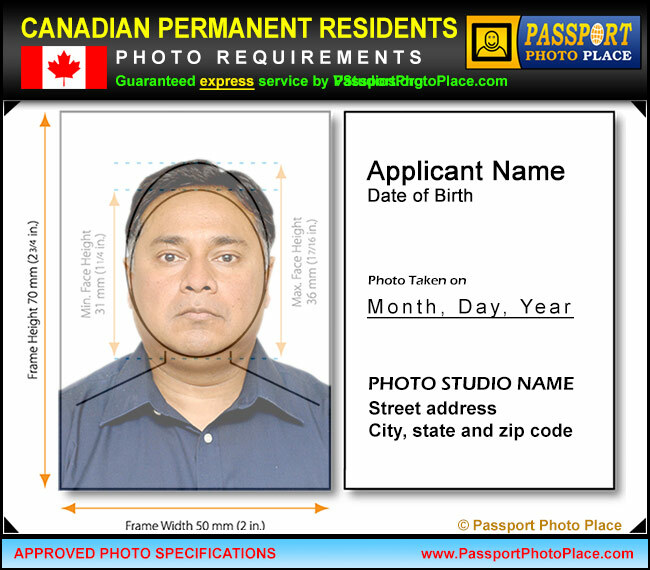 At Passport Photo Place, we provide same day photo service for Canadian Permanent Residents (PR Card) applications. The Canada PR photos we produce comply to the Government of Canada requirements as specified by current Embassy of Canada rules. The photographs taken for Canadian PR documents must be provided as printed version. Electronic files are optional and currently not required. Canadian Consulate requires the photographs taken by a commercial photographer that specializes in professional document photography. Photos from photographers that are not approved for document pictures can be rejected, causing lengthy delays in processing of Canada PR applications. Photo rejections are the most common cause of delayed processing of the resident applications. Passport Photo Place provides rapid service and produces Canadian PR card pictures that are 100% compliant with the Embassy of Canada and applicable Canadian Consulate(s). Following the strict requirements provided by the Canadian Consulate ensures that all PR card applications are approved on a timely basis. Guaranteed Canadian PR photo service. No Rejects! All Canadian permanent residence photographs are taken and printed following the most recent and updated requirements as provided by the Canadian Consulate. The photographs are produced and provided to a customer at the time of a photo session within 15 minutes minutes. All photos produced in our studio by a professional photographer that specializes in legal PR document photography and all other travel and immigration documents. Passport Photo Place makes photographs that look great and naturally represent each person. Our studio utilizes the latest in digital document photo technology that consistently produces accurate high quality pictures that are accepted at worldwide locations of Consulate General of Canada. All Canadian PR photos are taken and printed immediately at Passport Photo Place in Orlando, FL and instantly delivered to the customers. No need to come back for pictures! Pictures must be taken by a commercial photographer, correctly lit by studio lighting and exposed. Number of photos required is specified on the application guide. The background must be white with no shadows and with proper contrast to between background, hair, skin and clothing. The skin tones must be natural and precisely reflect individual’s skin tone. Canadian permanent residence photographs must be printed at 300dpi or higher resolution using a professional photo printer. Inkjet printers are not acceptable for producing legal document photographs. Please wear a solid-colored top/shirt. White or slightly off-white tops are not recommended since the background for Canadian PR photographs is white and there must be a defined contrast between clothing, subject and the background. Our Orlando, FL Orange County photo studio is accessible via major routes and in relatively close proximity from the following locations: Aloma, Altamonte Springs FL, Apopka FL, Apopka, Azalea Park, Belle Isle, Bithlo, Buena Ventura Lakes, Cambell, Casselberry, Casselbery, Celebration Florida, Celebration, Christmas FL, Christmas, Chuluota, Clermont, Cloud FL, Cocoa Beach, Cocoa FL, Cocoa, Conway, Davenport, Doctor Phillips, Eatonville, Edgewood, Fairview Shores, Fairvilla, Fern Park, Forest City, Goldenrod, Gotha, Hiawassee, Holden Heights FL, Hunters Creek, Kissimmee, Lake Buena Vista, Lake Butler, Lakeland, Lockhard, Lockhart, Longwood FL, Maitland, Meadow Woods, Merritt Island and Cocoa Beach, Mims, Narcoossee, Oak Ridge FL, Oakland, Ocoee, Orlando FL, Orlando Florida, Orlando International Airport, Orlando, Orlo vista, Orlovista, Oviedo Florida, Oviedo, Paradise Heights FL, Pine Castle, Pine Hills, Port Saint John, Rosemont FL, Sanford, Sky Lake, South Apopka, St. Cloud, Tildenville, Titusville FL, Titusville, Union Park, University Park FL, Windermere FL, Windermere, Winter Garden FL, Winter Park and Winter Springs.